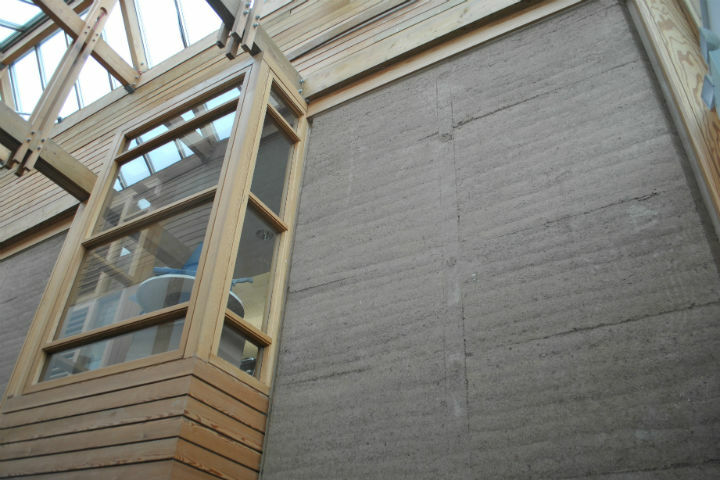 Two rammed earth walls built in the North East offer a modern low carbon interpretation of an ancient technology. People have been constructing rammed earth walls for over 2,000 years. The Great Wall of China, built largely of rammed earth, is a testament to the method’s longevity (1). The last 15 years have seen a resurgence of this timeless technology in the UK. Construction using traditional concrete block walls is carbon intensive, with around 7% of global CO2 emissions caused by the production of cement (2). By contrast, rammed earth walling has the lowest embodied energy of any masonry material (3). 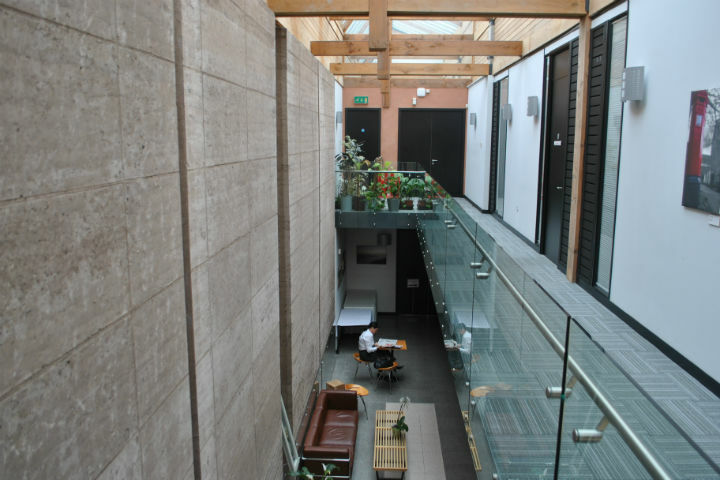 Jane Darbyshire & David Kendall Architects (JDDK) have built two projects in the North East using rammed earth walls. The Rivergreen Centre in Durham, built in 2005, has a 6m high wall which runs the full length of the atrium. A basement was excavated to build the plant-room, so it made sense to retain the earth on the site and make good use of it. The 600mm thick wall provides sufficient thermal mass to temper the internal temperature and humidity of the atrium and adjacent rooms. JDDK and Rivergreen visited similar walls at the Eden Project and the Centre for Alternative Technology before finalising the details. Samples of the soils on the site were analysed by the University of Bath, who confirmed that the sand was suitable for use. Some gravel and clay was imported from local quarries to achieve the right combination, but over 60% of the material came from the site. Rammed earth specialists Rowland Keeble and Andy Simmonds provided advice on the mix and the moisture content for the wall and later trained the contractor’s workforce. The sand, gravel and clay was blended in a paddle mixer, then placed into a formwork in 100mm deep layers. The thick layers of earth were compacted with pneumatic rams to half their depth, and these layers are clearly visible when the shuttering was removed. The rammed earth wall has a unique colour and texture. 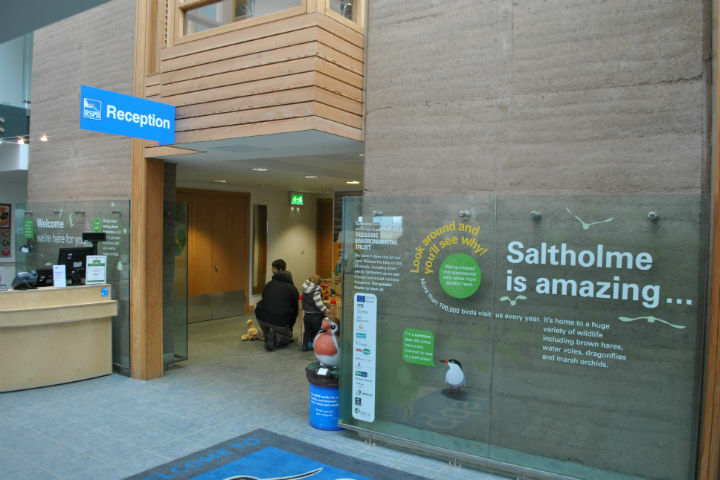 A couple of years later, JDDK incorporated a rammed earth wall into their visitor centre for the RSPB at Saltholme on Teesside. Again, using material from the site, the thick wall acts as a thermal store to control the temperature in the atrium. The building is open to the public, so glass protection was installed at lower levels to avoid people brushing against the rammed earth. The surface can be dusty, and it’s vulnerable deliberate scratching and scraping. Signage and graphics have been applied to the glass to tell the story of the visitor centre. These two rammed earth walls are a modern interpretation of an ancient technology. With low embodied energy, rammed earth construction can help to control internal temperatures and humidity in an elegant manner, making use of materials from the site in a low carbon way.